Blog images by Alejandra Porta. UPDATE: If you want to take your speaking dreams to the next level, visit ShineBootcamp.com to learn about the upcoming keynote speaker bootcamp for women taking place September 21st – 23rd, 2018 in Vancouver. Women are hugely underrepresented; whether it’s a panel or a conference speaker lineup, chances are it’s overrun with white men. Sexism is prevalent, and it spans from subtle (think underrepresentation, pinkwashed girls’ lounges) to overt (think harassment, non-consensual advances). There are exceptions (there always are), but this is the general rule, and it’s a huge stain on the industry you and I are both a part of. Now I want to make it clear, I’m not here to chastise anyone. As a used-to-be conference organizer, I’m guilty of it too. 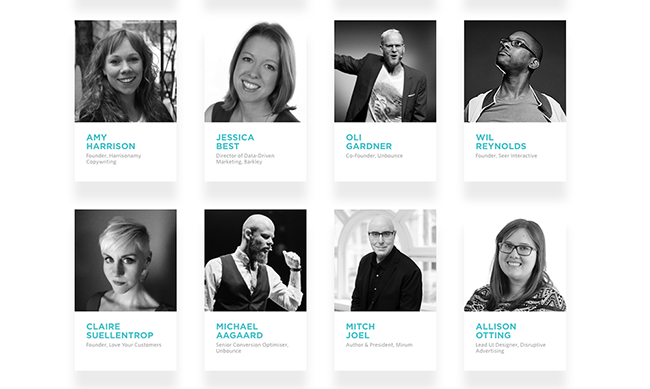 When I ran Unbounce’s first-ever Call to Action Conference (CTAConf) four years ago, I invited four women to speak, two of which spoke on a panel. The other seven were — you guessed it — white males. This is garbage. It’s unacceptable. And it’s not a reason at all — it’s an excuse. What it really came down to was, I wasn’t trying hard enough. I wasn’t asking my network for recommendations. I wasn’t doing enough research. I wasn’t making the extra effort required to widen the pool of speakers. I wasn’t committed to gender diversity. Fast forward to today and my perspective has completely changed. Not only because it’s important to me on a personal level, but also because it makes business sense. See, when you pull from the same pool of speakers as other folks in your industry, everything starts to look like white bread — bland and borderline junkfood. Your conference looks like that other conference that happened a few months ago. And the content? Yep, it’s the same, too. When you use the same speakers, your lineup looks like white bread—bland and borderline junkfood. By digging a little deeper and expanding your search a little wider, you can discover fresh up-and-coming talent with new perspectives, new things to teach. And you show female attendees that their voice and their professional development matter. And did I mention you sell tickets and attract more female attendees? Moz, which hosts its own conference (MozCon), reported that as the percent of female speakers increased so did the percent of female attendees. What else can I say but duh? I see a lot of progress being made around improving gender diversity in marketing and tech. People are asking questions, they’re holding companies accountable, they’re having those tough conversations, which is a great start. But what are people actually doing about it? This post will dig into specific steps you can take to improve gender diversity at your next event. They’re the result of an honest-to-goodness desire to do the right thing and our own cringe-worthy fumbles (more on that later). It’s my hope that these tips and tactics will help to alleviate any hesitation you or your organization might have about taking the leap. 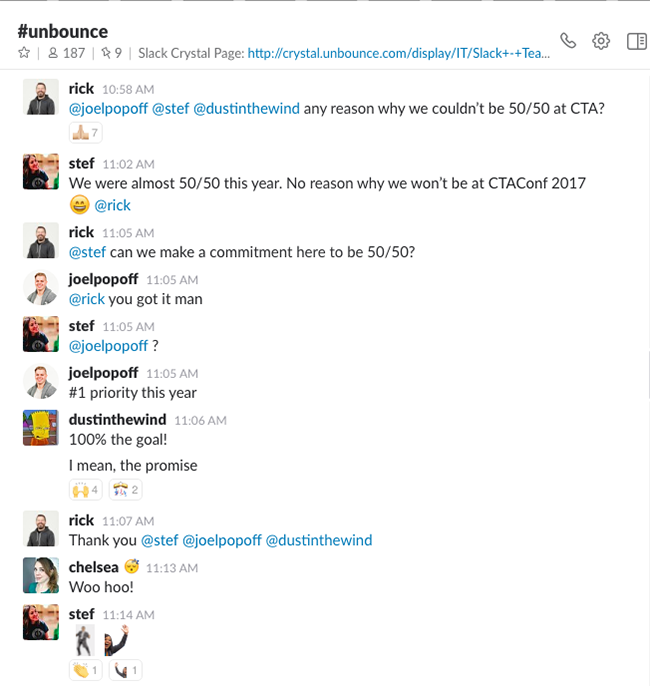 At Unbounce, we’ve been having conversations around gender diversity for months, so when Unbounce CEO Rick Perrault challenged us to commit to gender parity at CTAConf 2017, the response was a resounding YES, YES, YES. Making progress one Slack convo at a time. It’s as simple as this. And yet it’s a bit more nuanced as well. The truth is, achieving gender parity did take a bit more time and a bit more effort. But the result is a more dynamic lineup of speakers and an opportunity to tap into an audience that otherwise might’ve passed on your event. Forget ROI — talk about RO why not?! Commit to gender parity at your #marketing event—the result is a more dynamic lineup of speakers. 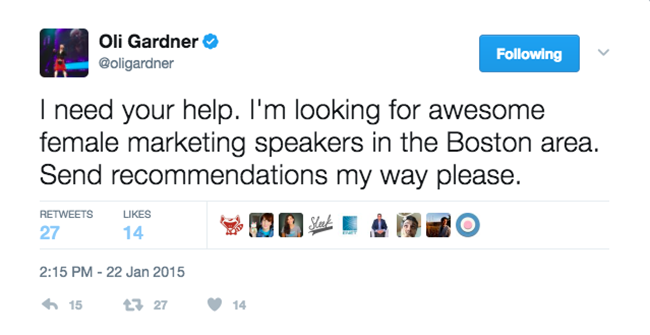 Leverage your social network and ask for recommendations via Facebook, LinkedIn and Twitter (like Unbounce Co-Founder Oli Gardner did for the Unbounce Road Trip in 2015). Pull from existing comprehensive lists such as this list of 1,000+ tech speakers who aren’t men and this one featuring 100 influential women marketers. Trade past speaker lists and ratings with your network of event organizers. I sent personal emails to every event organizer I knew asking them for their past speaker lineups and ratings, and in exchange I shared our list and ratings. This tactic is one is my faves, and it’s how we scored a ton of speaker leads for CTAConf. Email past presenters and speakers and ask them for recommendations. It’s how we found Claire Suellentrop, who’s speaking about creating high-converting campaigns using Jobs To Be Done at this year’s conference. I honestly believe that everyone has something to teach. EVERYONE. Regardless of gender, regardless of age, regardless of job title, everyone is an expert in something. It’s this belief that gave me the courage to raise my own hand and ask to speak at last year’s CTAConf. But I wasn’t a quote unquote speaker. I guess you could have called me a speaker in residence. I spoke at a few small-time events here and there, but I am not famous like Seth Godin. I don’t travel the world speaking at industry events or conferences. I was caught in a classic Catch-22: I couldn’t become a speaker without experience, but I couldn’t get experience because I wasn’t a speaker. But rather than focusing on what I didn’t have, our speaker selection committee focused on what I did have: enthusiasm and a whole lotta event marketing experience to boot. Once the committee deliberated, I spent two hours whiteboarding my talk with Oli. He and Unbounce Senior Conversion Optimizer Michael Aagaard also reviewed my slide deck multiple times, providing constructive feedback. Their expertise helped fill the gaps in my resume, so that when I stood up on that stage I felt prepared and supported. And guess what? It went really well. So what can you do to improve gender diversity at your upcoming event? You can start in your very own backyard. Encourage high-performing women at your company to speak at events, and offer them mentorship and support to get them up on stage. And if you’re a man who’s been asked to speak at an event, consider if there’s a woman you know who is equally qualified to speak on the subject. If there is, offer up your slot. In fact, Oli already did this, when he recommended me to speak at CIMC 2017. For every man asked to speak at an event, there’s a qualified woman who hasn’t been. Find her. A clear code of conduct helps create a safe environment for your staff and your event attendees by setting expectations for what is and what is not acceptable behavior. From a diversity perspective, a code of conduct is an especially helpful tool for making women feel at ease, because there are strict policies in place to deter discrimination and harassment. Creating a code of conduct out of thin air might seem intimidating, so I suggest pulling inspiration from existing codes and adding your own personal flavor. When we created our code of conduct, we looked to other companies we admired, specifically Moz and Atlassian. Wistia has written an exceptional post about how and why they created their code of conduct for WistiaFest, including how they made it visible. Humble folks that they are, they highlighted where they could have improved (so you can learn from their mistakes!). Wistia’s “Golden Rules.” Image via Wistia. Including these three core principles and your company’s core values is a great place to start. And remember, there are no rules when it comes to creating a code of conduct, except one… you have to be prepared to enforce it. A code of conduct is like insurance; you hope you never have to use it, but in those unfortunate circumstances, you’ll be glad you have something to back you up. At this year’s conference, we’re making our code of conduct front and center with printed posters hung around the venue. You’ll also find the code on the CTAConf website as well as in our conference app. And we’ve made it simple to report a violation by including a direct phone number to our event marketing coordinator in our code of conduct. While I can’t go into the specifics of every reported incident, I can tell you we’ve enforced our code multiple times, with attendees and speakers. Remember when I mentioned cringe-worthy fumbles? Well read on, readers. See, live events are a tricky beast. You have this very passionate person up on stage who’s pumped up and maybe a little nervous. You have no idea what’s going to come out of their mouth. You hope it won’t be anything offensive, but you really have no idea. Props to Annette for calling us out. It wasn’t our slide, but as event hosts, the content that gets projected for all our guests to see is our responsibility. Period. And next year, we’ll take a page out of Moz’s book by including our code of conduct right in our speaker and sponsor contract. So does all of this “extra stuff” add to our workload? You bet it does. But it’s something we account for now. And the payoff is invaluable. You may have noticed this post is focused on how to create a gender diverse event and not a diverse event. The truth is, we know we can #dobetter at elevating folks who aren’t typically asked to speak at events — not just white women, but people of color, non-binary folks and members of the LGBTQ community. We know we have more growing to do and we’re committed to it, just as we were committed to achieving gender parity at this year’s conference. I think we’ve come a long way as a company, and I think I’ve come a long way as a champion for women. The excuse I gave as a conference host nearly four years ago — that there weren’t enough qualified women speakers — is no longer an excuse. Click to see full lineup of speakers. 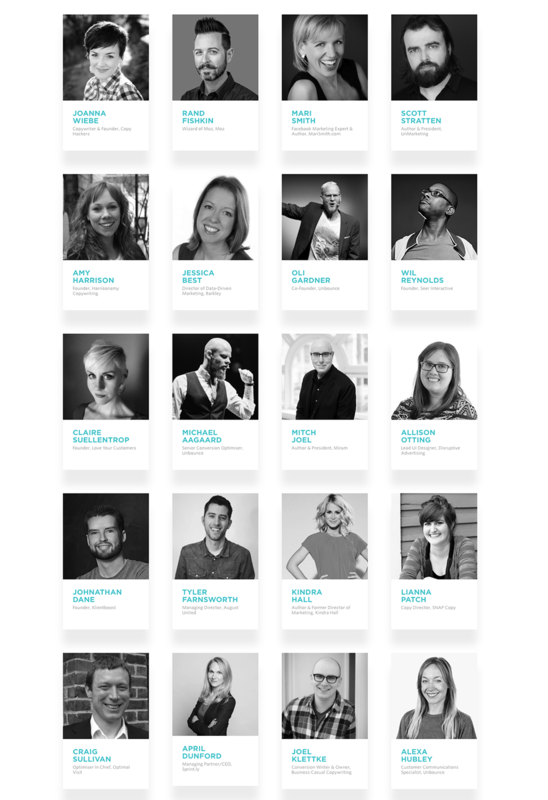 We’re welcoming 10 exceptional men and 10 extraordinary women to the CTAConf stage in June, and I couldn’t be more excited. Want to attend CTAConf 2018? For a limited time, get 10% off the 2 for 1 rate (just $269.10 a ticket)! Enter the code BLOG2FOR1TREAT here. As the 9th employee at Unbounce, Stefanie Grieser has gone from scrappy startup marketer to passionate, scale-up leader, heading up international markets, partnerships and events. She was named top 100 female marketers to follow and loves turning a good idea into an impactful, memorable experience. Find her on Twitter @smgrieser.